Have you ever wondered why the marriage in Cana took place on the THIRD DAY? Why not the second day or the fifth day? Why mention any particular day at all? Well, when one begins to look at all the scriptures that have the phrase “THE THIRD DAY” a surprising pattern surfaces. There are a total of 53 passages of scripture that refer to a third day. Now to me this stood out as being significant so I began to study these third day scriptures. The Bible tells us that the things written in the Old Testament were shadows of things to come. We are also told that they are examples. Hebrews tells us that the things written were figures of the true. Look at chapter nine and verse twenty four in the book of Hebrews. The things written in the Old Testament are shadows of things to come. They are our examples or patterns to follow. They are figures or in other words types of things to come. Many, if not all, of the things written in the Old Testament have two fulfillments. The first fulfillment is the type shadow or example of how the future fulfillment will transpire or take place. What I mean by this will become clearer as we read some of the third day scriptures. Let’s continue with John 2:1-11. I am not going to quote the entire passage here in this study but only pull out what the Holy Spirit has shown to me. Notice “the who” that was invited or called to the wedding in verse number two. Now compare this with several other scripture in the word of God that teach that we, the church, the body of Christ Jesus, are the BRIDE of Christ and on the day of his return there will be a marriage between the Lamb, which is Jesus and bride, the church. Now I propose to you that the marriage of the Lamb will be on the THIRD DAY. The Bible teaches us that we shall be CHANGED in a twinkling of an eye. These mortal bodies in that we now live in will be changed to immortal bodies. Now I want to draw your attention to A CHANGE that took place at the wedding in Cana. Jesus had the water pots FILLED to the brim or in other words to overflowing. Then he had the water served to the guests. However the water was CHANGED into the finest wine. Again I propose to you that our CHANGE will also take place on the THIRD DAY? Let us continue looking at other scriptures that refer to the THIRD DAY. We see in verse 34 that it is Jerusalem that kills the prophets. The day following was the third day and it was this day that Jesus was crucified. Hebrews 11:40 tells us that we shall be made PERFECT together, and we know that our change or being made perfect will occur at the second coming of Jesus. There are many scriptures that tell us that Jesus was raised from the dead on the THIRD DAY. Matthew 16:21, Mark 10:34, Luke 24:7, Acts 10:40, I Corinthians 15:4, and several other scriptures clearly show that Jesus was raised on the THIRD DAY. But I propose to you that the dead in Christ shall ALSO take place on the THIRD DAY. We know from Revelation 19:8 that we shall be clothed in white raiment on that great and notable day of the Lord when we shall be changed. In other words we shall put on our royal apparel. “Now it came to pass on the THIRD DAY, that Esther put on her royal apparel, and stood in the inner court of the kings house: and the king sat upon his royal throne in the royal house, over against the gate of the house." And in verse 16 we are called the temple of God. So in other words the church is God’s HOUSE. Will God’s house or temple that is to say God’s church be complete or finished on the THIRD DAY? At the time of the rapture of the church those who are faithful believers along with the dead in Christ shall rise up to meet the Lord in the air. In other words we will be caught up or GO UP to be with the Lord. I propose to you that the church will GO UP in the rapture on the THIRD DAY. 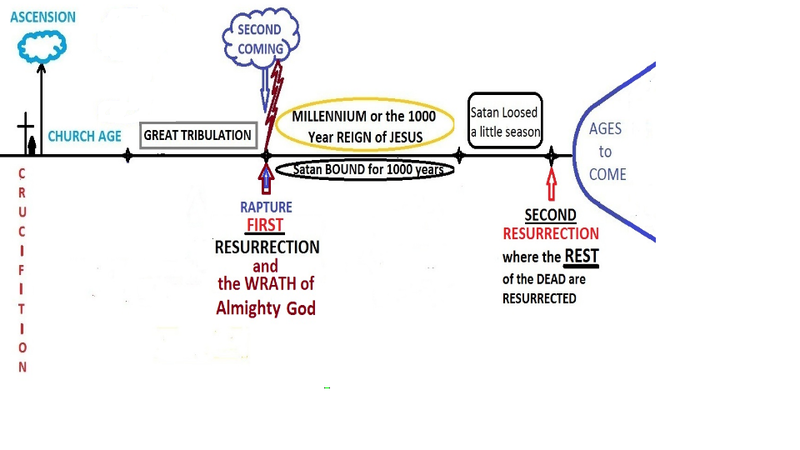 As you can plainly see there are many parallels with these THIRD DAY scriptures and the coming of the Lord, the resurrection of the dead in Christ, our change, our going up or rapture. And it is my opinion there far too many to just pass of as coincidence, so therefore I believe it is safe to conclude the second coming of Jesus will be on the THIRD DAY. Now to fully understand and see the patterns set forth in the Old Testament of when this THIRD DAY will actually be we will need to study the feast days that were commanded of God for the children of Israel to keep. However due to the length of the study I have set it apart as a study of its own entitled, “The Feast Days of the Lord”. In this study we shall explore the days and months of the year of the Jewish calendar and the significance of the feast days in relation as types and shadows of things to come, that is to say, their future fulfillment.